to construct a contemporary circus show. Using comedy, circus, parody and music watch as a gym junkie, a surfie and a reformed hippy endeavour to explore what it takes to make a piece of ‘contemporary art’. 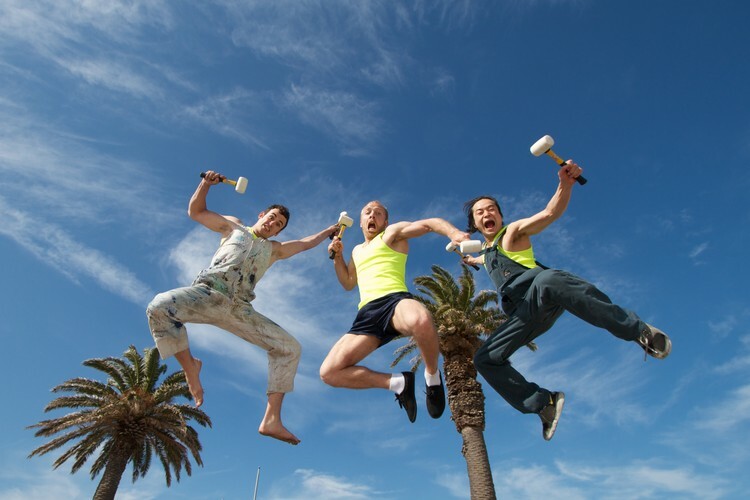 In 2011 Three High Acrobatics was awarded the Circus Oz Award for the spirit of collaboration required behind KNOCK OFF Knock Off and won the 2012 Circus Showdown at Gasworks Arts park (Melbourne). With SOLD OUT shows at Adelaide Fringe Festival, Sydney Hoopla Festival and The Spiegletent at the Docklands, come see yourself why audiences are loving Three High Acrobatics! Accentuated by an all important soundtrack of classic pub rock anthems, KNOCK OFF entertains audiences with fast-paced, humorous and highly skilled circus acts using teeterboard, ladder,manipulation, aerial rope, partner acrobatics and more.